Von Miller and the Denver Broncos' defense stifled the Carolina Panthers' offense to secure a Super Bowl 50 victory this past February, but it wasn't without a little help from above. Obtaining important information from his perch in the booth, Mitch Tanney, 11MBA, played a crucial role in the team's success as its director of football analytics. Uncovering insights invisible to the average observer, data analytics has steadily grown in prominence since the 2003 book, Moneyball, about how the Oakland Athletics remained competitive with larger market teams through manipulating statistics. Although better preparing for game day with data was well-established prior to this best seller, the NFL has hired more analytics personnel in recent years. Tanney joined the Broncos in 2015 after serving in a similar role for the Chicago Bears. "At its core, analytics is the process of transforming data into information to learn something new or challenge intuition," says Tanney. Among other uses, such data can help coaches objectively evaluate player performance, make play-calling decisions, and manage salaries. Tanney's interest in the game goes back to his own days on the gridiron (see photo), when he starred as quarterback at Lexington High School in Illinois and finished runner-up for Division III National Player of the Year at Monmouth College. Tanney also played in the Arena Football League, the Indoor Football League, and overseas with the Limhamn Griffins in Sweden. While at the University of Iowa, Tanney cultivated a passion for math–particularly during an independent study in sports analytics under Jeff Ohlmann, associate professor of business and co-director of Tippie's management sciences undergraduate program. Those experiences opened his eyes to what was possible in the field, and Tanney continues to benefit from Ohlmann's mentorship. Whether gauging an opponent's tendencies, observing historical trends, or using quantifiable measurements to grade player performance, Tanney approaches numbers in an inquisitive manner. 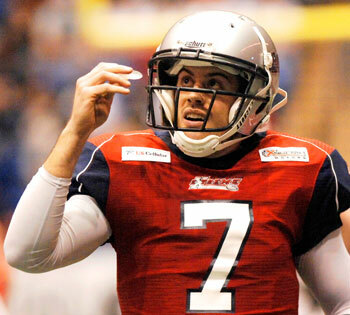 "The key for me is continuing to ask why," says Tanney. "If data analysis combined with film study can help answer why certain philosophies are successful or unsuccessful, then I've helped improve our organization."